It sits across the road from Vintner's Bar & Grill and the famous Barossa Farmers Market and only 500 metres from Salter's restaurant. 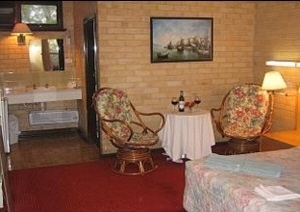 The Vineyards Motel offers friendly and professional service and is the perfect base for daily excursions around the Barossa Valley's many cellar doors and other sights. Bus Tours to several points of interest can be organised from our Reception. The Motel has 21 units of various configuration and can take groups up to 58 people. It has a pool area with BBQ facilities overlooking the beautiful Saltram's Vineyards. Ensuites with showers, AC/Heater, Fridge with soft drinks, TV and clock radio, Austar with 7 cable channels, Wireless broadband, Telephone, Toaster and Kettle, Tea, coffee and biscuits, Iron and ironing board and Undercover at-the-door carparks. The Deluxe rooms are twice the size of the Standard rooms. They have either Queen Size beds or King Size beds. Free Wireless Internet access is available.An Internet kiosk is in located Reception. Vintner's as well as Salter's Restaurant, 500 metres west of the motel, hosts many weddings and functions during the year and a large portion of the guests stay at the Vineyards Motel. Any time between 1pm and 8pm. After hours arrival can be organised. In front of rooms undercover carparks to all rooms. 85km from Adelaide Take Sturt Hwy. (A20) to Nuriootpa. Drive toward Tanunda. As you leave Nurioopa after the BP turn left for Angaston. 4km then an intersection with Stockwell Rd. Turn left 50m. Located across the road from Vintners Bar and Grill and the Barossa Farmers Market. 500 metres from Saltrams Cellar door. The world famous Barossa Valley has over 50 Wine-cellar doors in close proximity, an array of local produce, friendly atmosphere and adventure such as Helicopter tours and Air balloons.